In the recent debate on universalizing health services there has been a broad agreement that the State must play an important role in strengthening public health services. In order to strengthen public services, the high level expert group report calls for increasing financial outlay on public services, ensuring access to free medicines and abolishing user fees for consultation and diagnostic testing in public institutions. However, the contentious part of the debate is regarding the role of the private sector. There is once again a broad agreement that given the large presence of the private sector at the primary, secondary and tertiary levels, it cannot be wished away, but needs to be regulated. Much of the writing on regulation of private interest tends to focus on doctors and institutions. , However, what one needs to recognize is that these interests have expanded and consolidated their presence in the various other sub-systems of the health services - such as finance, drugs, technology, medical education, nursing education, paramedical training and research. Among these there are local, regional, national and global players who are engaging with each other as allies and adversaries. They have also forged relationships with the political class at all levels. These engagements are fraught with contradictions and conflicts given the varied nature of interests in this sector. Therefore, the first challenge for regulation is the need for a systems approach to regulation while factoring in the complex interactions between the multiple actors within this sector and their engagement with the political leadership at the national, state and local levels. The second major challenge is that the private sector is multi layered with a plurality of actors and interests. Given the deeply entrenched presence, regulation is contested at every level that is articulated through lobbies and other forms of pressure group politics. Thirdly, given the growing influence of commercial and corporate interests on policy making, regulation is increasingly being shaped by these groups that tend to further the interests of big capital. A review of government reports and research papers on the status of regulation reveals that it is lacking in a systemic approach and has addressed only some aspects of the health service system. 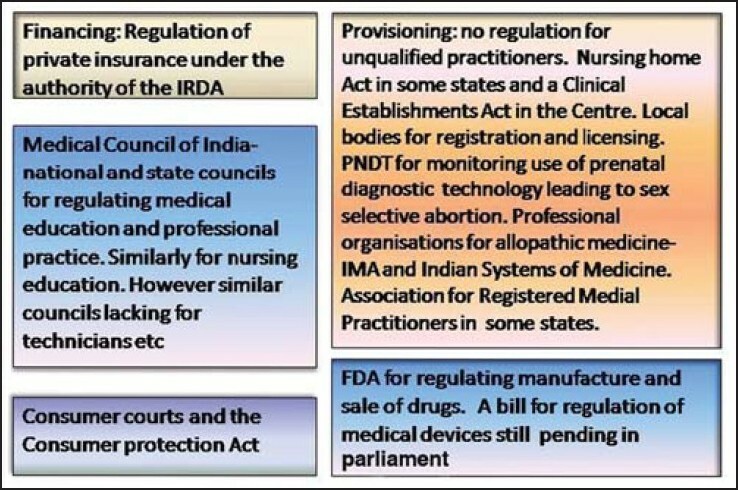 There are legislations in place for regulating provisioning, professional conduct, medical and nursing colleges, drugs and none for medical devices. Nandraj succinctly shows the gaps in regulation and argues that the provisions in many of these legislations are inadequate. In addition, there is a lacuna in a comprehensive approach to regulation. A case in point is that the bill for regulating medical devices is still pending in the parliament. It is well known that regulating providers in the absence of legislation to register and monitor use of devices leaves a lot to be desired. The second major gap is that most of these legislations are centrally driven and is not mandatory for states to take it on board. This is apparent in the differential uptake of the bill to regulate the clinical establishments act across states. A working group report set up by the planning commission during the eleventh plan period has reviewed the status and the need for regulating clinical establishments. It points out the resistances from professional organizations and in some cases even the medical and nursing council to such regulations. This has serious consequences for effectiveness in design and implementation of regulatory instruments. Given the inherent weakness in the availability of regulatory instruments across sub-systems and the different time points at which they have been initiated, the working group suggests that it may be appropriate to move toward an overarching framework for regulation that brings these diverse instruments to speak to one another. The following [Figure 1] amply illustrates the fragmented nature of regulation and the gaps that exist across sub-systems under multiple authorities. Regulation is often seen as a technical and administrative problem that can be addressed with adequate "political will" However, if we employ the lens of power to study the private sector then one can delineate and analyze its complex architecture; the contradictions and alliance between its various actors; the nature of their influence and engagement with the political processes at the local, state, national and global level. Given the complex structure of the private sector, with a range of institutions and actors, there is an intricate network of power relations that has emerged. One can clearly discern a hierarchy in the distribution of power among the different actors and their engagement with the political processes at the local, state, national and international levels. The distribution and representation of power within the private sector can be captured through levels of interest. These could be broadly classified as dominant, challenging and repressed interests. We have classified the dominant interests as represented by pharmaceutical, medical equipment industry and the tertiary, corporate hospital industry, Indian and foreign. The challenging interests to include actors and institutions at the secondary level and the repressed interests would include the informal sector at the primary level. Over the last three decades, there is a growing presence of corporate -insurance, pharmaceutical and the hospital industry in health services delivery. These sectors are privileged by state policy since they are seen to be revenue earners for the economy. In terms of Foreign Direct Investment, the health sector is deemed as an internationally competitive industry and subsidies are offered to them. They also play a vital role in setting the agenda for trade in health services, pharmaceutical and bio technology in global trade agreements. These trends are visible in the manner in which the Indian corporate sector has managed to wrest public subsidies, consolidate operations and articulate its interests through forums like the Confederation of Indian Industry and Federation of Indian Chambers of Commerce and Industry. They have been able to lobby with the highest levels of the political leadership at the national and state levels to ensure their interests are protected and enhanced. The pharmaceutical, medical equipment and hospital industry have been privileged with public subsidies since these are seen as revenue earners for the economy. The Indian pharmaceutical sector is a major exporter of drugs to several developing countries in south Asia and Africa. They have received a great deal of support from the government for consolidation and expansion during this period. The engagement of corporate hospitals with the central government health services system, their promotion by state led insurance programs like Arogyasri in Andhra Pradesh and Chiranjeevi scheme in Gujarat are examples of such partnerships. There is a fairly large market that can be tapped with such tie ups. If the government chooses to leverage insurance as a means to universalizing health-care, the hospital, diagnostic and equipment industry would be willing partners. The challenge to such dominant interests is posed by diverse set of actors and institutions at the secondary level. These include nursing homes, medical, nursing and paramedical training institutions, diagnostic centers and pathology labs. These institutions operate mostly at the state level and a section of them have alliances with dominant interests. For example, Arogyasri in Andhra Pradesh has a partnership with several corporate hospitals like Apollo Hospital, among others. The uneven growth of health-care provisioning and medical education across the country poses a challenge for a uniform regulatory policy. Recent data shows that 40% of private medical colleges are located in Karnataka, Andhra Pradesh, Tamil Nadu, Kerala and Maharashtra. These medical colleges are largely promoted by intermediate and backward castes in these states - Reddy and Kammas in Andhra Pradesh, Patils in Maharashtra, Chettiars and Mudaliars in Tamilnadu, Vokkaligas and Lingayats in Karnataka. Medical colleges run by these dominant political groups have links with regional capital, non-resident Indian doctors and state level politicians (personal communication with Dr N. Ananthakrishnan, Medical Council of India, November 2010). The powerful alliance between private medical colleges, nursing homes and government doctors pose a huge challenge to public policy and regulation. *Narayana's study on informal practitioners in Khamam shows how they refer cases to private hospitals and there is well worked system of commissions. This was also documented by the author in Mahaboobnagar district. Informal practitioners had links with diagnostic centres and hospitals to whom they regularly referred patients from the villages. Here, again commissions were paid for the cases referred. This paper has tried to argue that the regulation of the private sector is an important aspect for achieving universal health-care. It amply demonstrates that regulation has been sporadic, fragmented and weak in implementation. Given the regional diversity of this country, available regulation has not been ratified and implemented by all states. The professional associations and councils have in several instances opposed or flouted the regulations when implemented. Going beyond regulation, this paper attempted to explain why this impasse exists in regulation. It used the lens of power to tease out the hierarchy, contradictions, conflicts and alliances that exist within the private sector in order to explain the limitation faced for regulation. This paper was first presented at the Discussion on "Towards a Public Services and Community Centered Health Care System" on 24-25 th January, 2012 at JNU. A modified version has been published as: Baru, R. A limiting perspective on universal coverage. Economic and Political Weekly 2012, Vol. XLVII, No. 08, February 25. 1. Nandraj S. Unregulated and unaccounted: Private health providers. Econ Polit Wkly 2012;XIVII:12-5. 2. Bennett S, Dakpallah G, Garner P, Gilson L, Nittayaramphong S, Zurita B, et al. Carrot and stick: State mechanisms to influence private provider behavior. Health Policy Plan 1994;9:1-13. 3. Baru R. Private Health Care in India: Social Characteristics and Trends. New Delhi: Sage Publications; 1998. 4. Baru R. A limiting perspective on universal coverage. Econ Polit Wkly 2012;XLVII:64-6. 5. Williamson C. Alford's theoretical political framework and its application to interests in health care now. Br J Gen Pract 2008;58:512-6. 6. Available from: http://www.usief.org.in/Institutional-Collaboration/Obama-Singh-21st-Century-Knowledge-Initiative-Awards.aspx. [Last accessed on 2012 Feb 12]. 7. Damodaran H. India's New Capitalists: Caste, Business, and Industry in a Modern Nation. Ranikhet: Permanent Black in Association with The New India Foundation; 2008. 8. Narayana KV. The Unqualified Medical Practitioners: Methods of Practice and Nexus with Qualified Doctors. Working Paper No. 70. Hyderabad: Centre for Economic and Social Studies; 2006.